These short-legged aerial insectivores are the most abundant small birds in the Oligocene deposits of the Quercy fissure fillings. Their taxonomy was revised by Mourer-Chauvire (1980), who recognized four species: Archaeotrogon venustus Milne-Edwards, 1892 (late Eocene to late Oligocene), A. zitteli Gaillard, 1908 (early to late Oligocene), A. cayluxensis Gaillard, 1908 (late Oligocene), and A. hoffstetteri Mourer-Chauvire, 1980 (from the old collections of unknown age). A. venustus is the best known archaeotrogon and also has the largest temporal range, existing over a period of 15 million years. 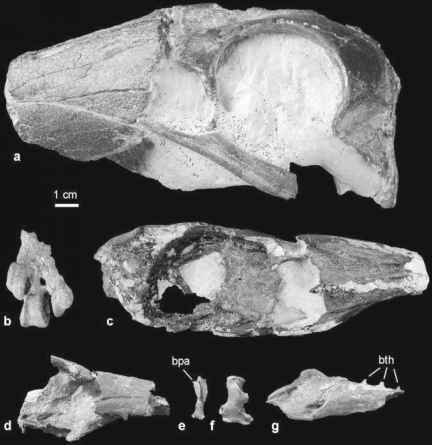 All major postcranial elements of this species have been found (Mourer-Chauvire 1980, 1995c). The humerus is quite stocky, with a wide proximal end and a double pneumotricipital fossa. As far as this can be inferred from the isolated bones and in contrast to the humerus of most other taxa included in the present chapter, the bone was only slightly shorter than the ulna. The extensor process of the short carpometacarpus forms a pointed spur (Fig. 12.6), which may have served for defense or intraspecific combats. Archaeotrogons were collected by Michael Daniels from the early Eocene London Clay of Walton-on-the-Naze (see Table 4.1 in Feduccia 1999). I have examined these specimens, which were mentioned by Mourer-Chauvire (1995c), and can confirm their identification. Most notably, substantial portions of a swift- or goatsucker-like beak are preserved in one of the fossils. As in Archaeotrogon, there is a spur on the carpometacarpus. Putative archaeotrogons are further known from Messel (Mayr 1998a, 2004d). 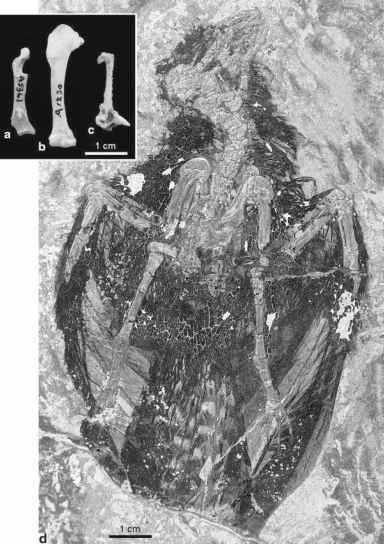 The species from this locality, Hassiavis laticauda Mayr, 1998, was referred to the Archaeotrogonidae because of a similarly shaped humerus and tarsometatarsus, and similar wing proportions. H. laticauda has an owlet-nightjar-like beak, but owing to the rather poor preservation of the fossil specimens only limited comparisons with the species of Archaeotrogon are possible. The coracoid of the Messel species differs from that of Archaeotrogon in that the omal extremity has a hooked outline, whereas it is rounded in Archaeotrogon. The carpometacarpus does not bear a spur. Some specimens exhibit well-preserved feather remains and the tail resembles that of nightjars (Caprimulgidae) in its shape; in one fossil the tail feathers show a distinct barring (Fig. 12.6; Mayr 2004d). Mourer-Chauvire (1980) noted similarities to the Caprimulgidae. Cypselomorph affinities of archaeotrogons are confirmed by the above-mentioned London Clay specimens with a goatsucker-like beak (Mourer-Chauvire 1995c), but their position within that clade is unresolved.